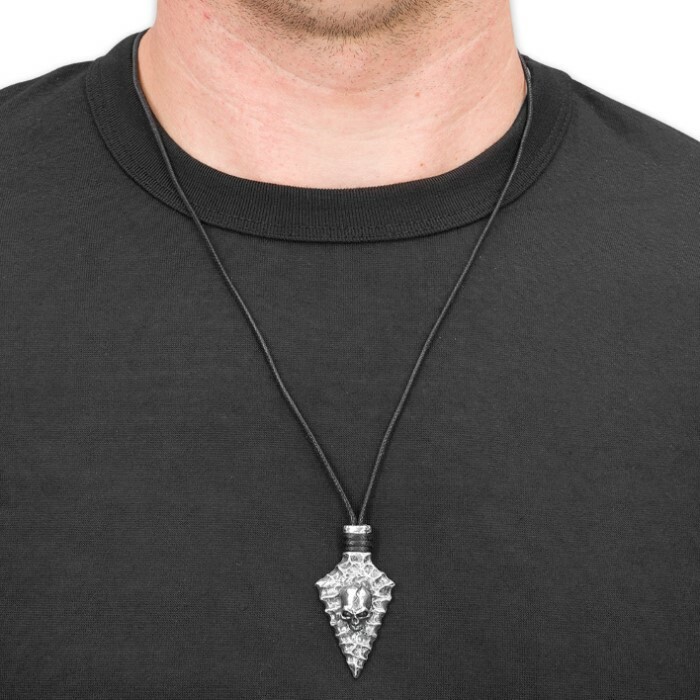 Imagine - this exquisitely dark, stunningly detailed necklace hangs from the neck of an ancient chieftain – the head of the tribe in the ages of darkness, long since lost to the mists of time. 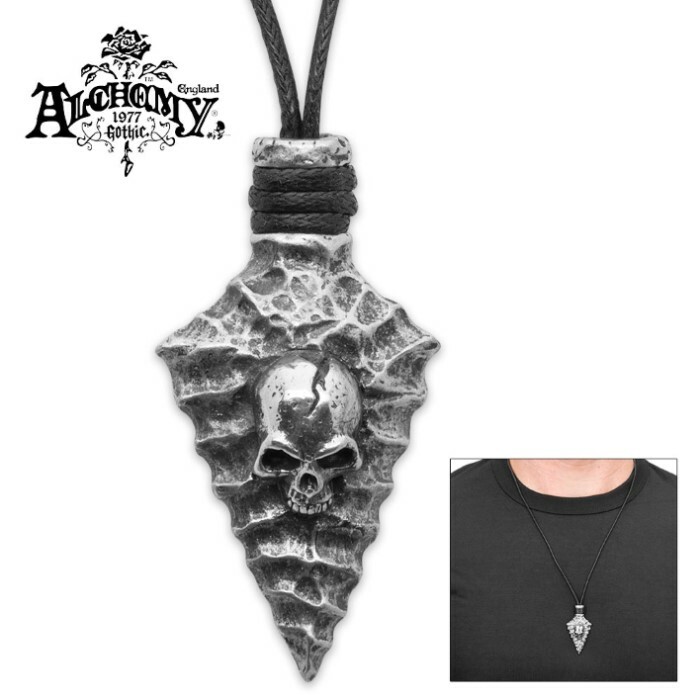 Asserting primitive power in the long-distant days before order, the arrowhead symbolizes power in bloodshed, while the skull evokes death – a not-so-subtle warning from a savage tyrant who maintains his grip on absolute authority via brutality and fear. Assert your strength and power every time you don this menacing pendant, forged with antiquated pewter and bound by a 24” black suspension cord that doesn’t draw focus from the impressive skull-in-arrowhead showpiece. At just under 2 1/5” high x 1 3/20” wide, the pendant is amply sized to tastefully stand out, while not overpowering your overall fashion motif. 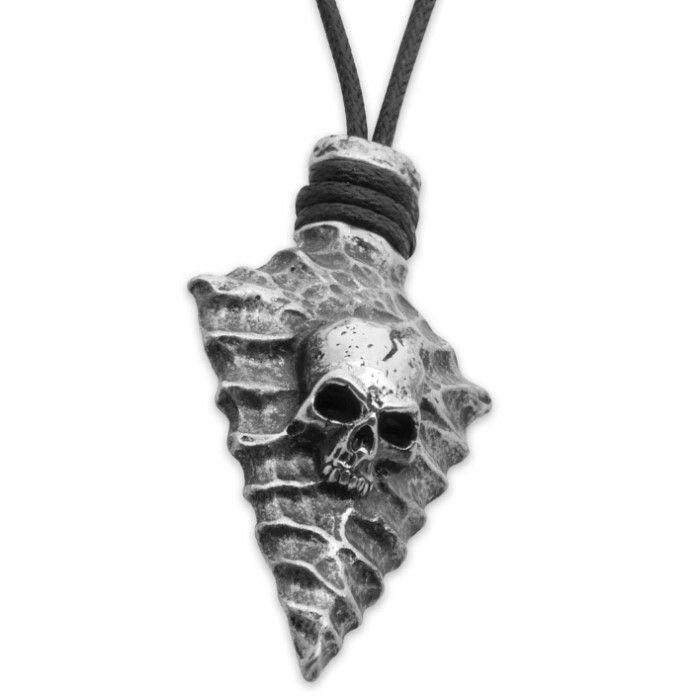 Despite its relatively small size, this pewter beauty is loaded with fine details like intricate simulated flint chipping and skull cracks. You can almost see it resting on the chest of that ancient barbarian warlord as he addresses his hordes of subjects. This distinctive necklace pairs handsomely with almost any wardrobe and looks equally great on men and women. Makes a lovely gift for birthdays, anniversaries, Valentine’s Day or any occasion. And it doesn't just improve people's looks! Hang it from your rearview mirror, a wall tack, mantle, etc. - perfect for the jewelry-averse.